There a many Melbourne markets where you can find real bargains and land amazing finds of pre-loved home wares, vintage stuff, trash and treasure, and bric-a-brac. It is always an adventure. You never know what you may find on your Melbourne market adventures. Check here for a separate page for hip - and not necessary cheap - Melbourne Vintage Markets. For an abundance of pre-loved and new books, visit the Federation Square Book Market. It is held every Saturday in the Atrium at Federation Square. You can spend hours there, rummaging through nearly 5000 books: fiction, literature, kids books, history, travel and art books, and books on just about every thing else as well. It is prominently located within the Federation Square complex, next to the Ian Potter Art gallery, arty shops and cafes, making it a pleasant experience even without buying books. This Melbourne market is a local hot tip, extremely popular and a surprisingly huge second-hand market. It attracts buyers and sellers from all over Melbourne. This is where you can pick up some pre-loved designer label, lots of vinyl and bits and pieces out of the coffers of people clearing out their homes, as well as from seasoned second-hand traders. However, this is also one of the places through which professional vintage fashion traders roam, so it's best to be early. This market has such variety, that if this was the only place you ever shopped you would probably find everything you needed. It is held on Sunday morning, behind the Burke Street shops, across the whole Station Street car park along the back the shops. It is only a short walk from Camberwell train station. The Camberwell Market only trades second hand and hand-crafted goods, nothing commercial! Its abundance of stalls with collectibles, bric a brac, clothing, hardware is loved by collectors and treasure hunters alike. The Coburg Trash & Treasure market is one of the open air Melbourne markets that indeed sells a lot of trash and treasure. It's like hundred garage sales in one, with junk sprawled onto tables or blankets on the ground. This is a place to find some real gems! Second-hand videos, records, jewellery, car parts, clothes, plants, toys, you name it! Very cheap! It is on every Sunday. Better to go in the morning as traders pack up early! In the Coburg Drive-In on Sundays. 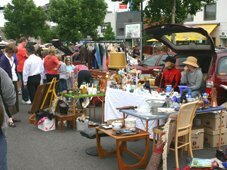 The Trash & Treasure markets in Dandenong and Wantirna follow the same concept. They really are a forum for the sale of new second hand goods and bargains. If you have something for sale, pack up the car and turn up in the morning at one of these markets. These marketss bring together private buyers, sellers and swappers, enabling them to deal with each other in an original market atmosphere. You will find garage sale type bits and pieces, ethnic fruit and veggie stall vendor, car parts, tools and arts and crafts. They are held at 115 South Gippsland Highway, Dandenong South; and corner of Mountain Hwy and Boronia Rd, Wantina - every Sunday from early til 2pm. The Rubble and Riches Market is located in the west if Melbourne in Leakes Road, Laverton. This is the place to really find a bargain or a genuine vintage frock or jewellery and not pay the trendy inner-city price for it. A great place to rummage through! It is huge! There are stalls upon stalls (1400) of second-hand trash and treasure, as well as new goods, plants and produce, located within a huge outdoor area, as well as in two pavilions. This market is a place for junk, trash, junk food and great bargains, which you can often bargain down even more. Making the effort to drive out there is worth it if you find the cherished piece you have been looking for, or something you have not been looking for, but really need. It is open all weekend, every week. This is one of the real cheap places to get not just second-hand, but also new stuff. Very ethnic with goods from around the world for the local community. There are bargains from toys to furniture, from pets to fashion, ugg boots to carpets and sheets, as well a trash & treasure and bric-a-brac section. This is where you can find preloved whitegoods, electrical, furntire, and bits and peieces. It is on every weekend, at 400 Mahoneys Rd, Campbellfield. This is another huge market for great bargains, with everything, particularly a large computer section. There is a whole array of bric-a-brac, but also fresh produce, plants, arts & craft, homewares, clothes & shoes. It is held on Wednesdays, Fridays and Sundays at Caribbean Gardens. Other places to get second-hand bargains are garage sales - keep your eyes open for lampost signs on weekends. Op shops are also places to find amazing treasures and clothing labels for next to nothing. They are spread all over Melbourne. And there are the vintage shops - not necessarily cheap - that have sourced a great selection of the best vintage clothes and goods.